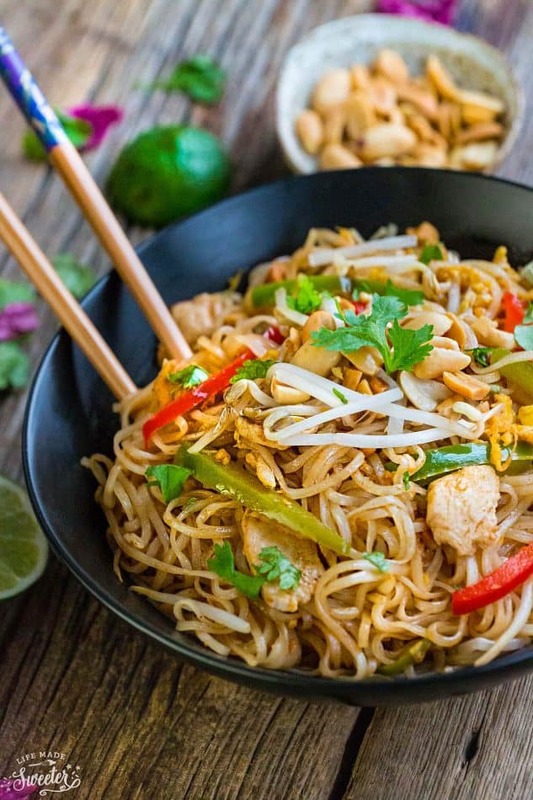 Chicken Pad Thai Noodles is the perfect easy weeknight meal. 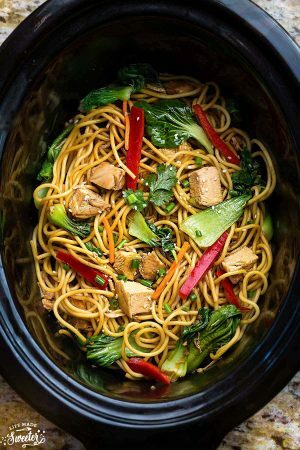 Best of all, this homemade recipe is full of authentic flavors and so much better than restaurant takeout! Great for Sunday meal prep or take the leftovers in school lunchboxes and work lunch bowls. Plus video! Pad Thai is my favorite thing ever to order whenever we go for takeout. 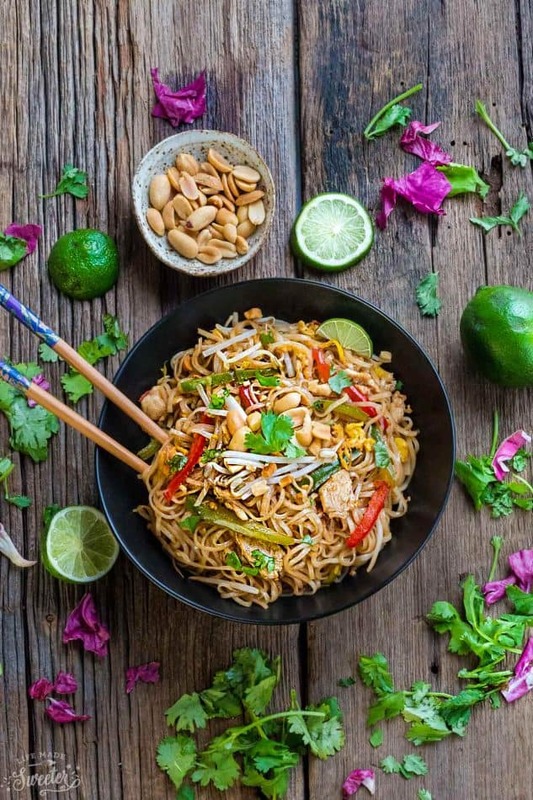 In fact, if I had to choose just one food that I wouldn’t mind eating forever, it would be noodles OR anything Thai-inspired. My dad has some family in Bangkok and we had a chance to visit on our tour around Asia when I was about ten years old. Then when I was 20, I had a chance to go back again with just my mom. I fell completely head over heels on both visits — especially for the food. Their signature flavors made up of sweet, sour, spicy and savory just make my heart sing. I spent a big chunk of my visits in the kitchen just following my aunts along and helping them out with meals whenever they let me. Of course, Pad Thai was on my list of things I had to master. 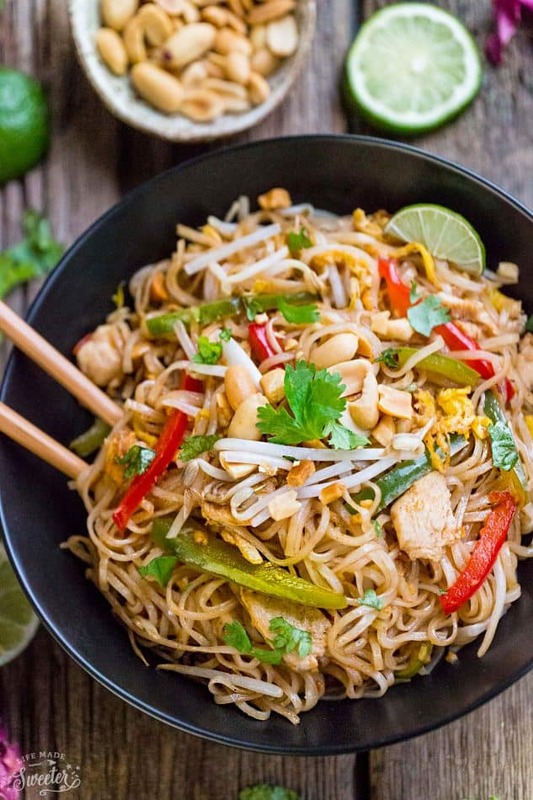 Pad Thai has to be the most popular dish that everyone thinks of when it comes to Thai food. 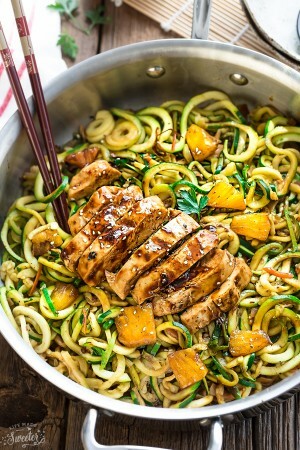 We also love this Sweet Potato Noodle version and this Pad Thai Zoodles which makes a great lower carb grain free option. But in Thailand, Pad Thai is just a common street dish you can find just about everywhere. 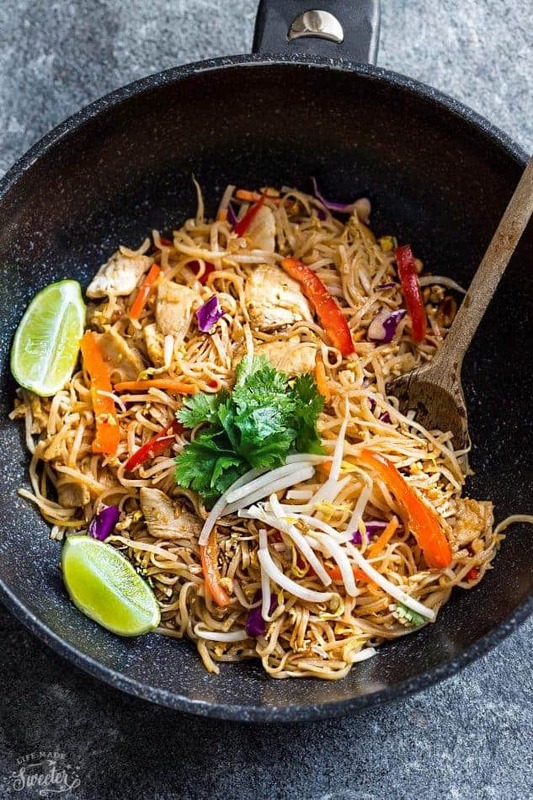 My Easy Chicken Pad Thai is packed with all of those unmistakable complex flavors everybody loves when they have Thai food in an authentic Thai restaurant. 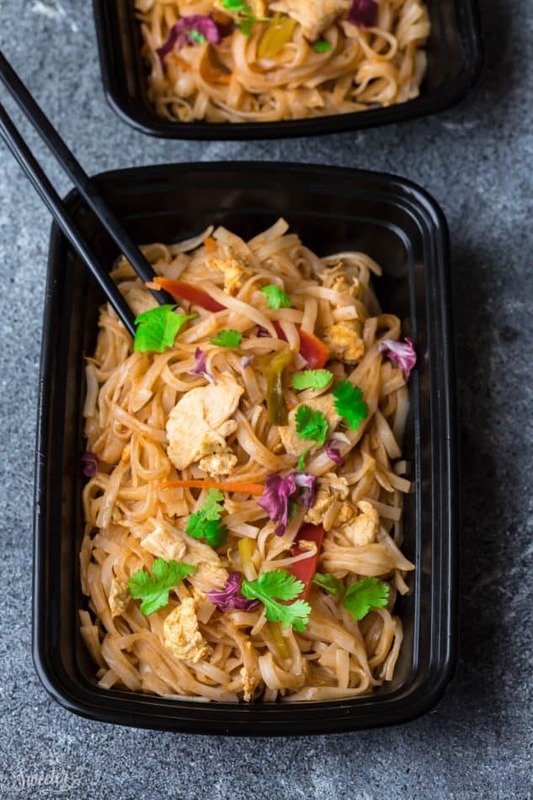 This Chicken Pad Thai is almost the same as the version I have in my cookbook, except I’ve simplified the ingredients a little bit and included allergy-friendly substitutions as well. You can also easily customize this recipe by swapping out whatever vegetables you have on hand. Don’t like chicken? Feel free to leave it out for a meatless version or make it with your favorite protein instead. Either way you choose, this dish can be on your dinner table in as little as 25 minutes – or less if you have everything prepped ahead of time! 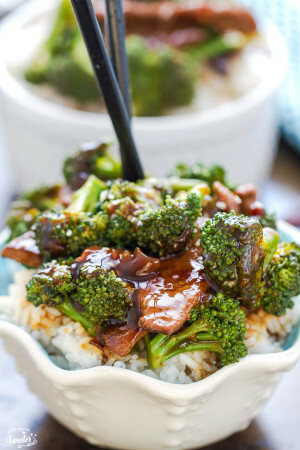 Much quicker and better than takeout! Plus, it reheats beautifully so it makes delicious leftovers for lunch the next day. 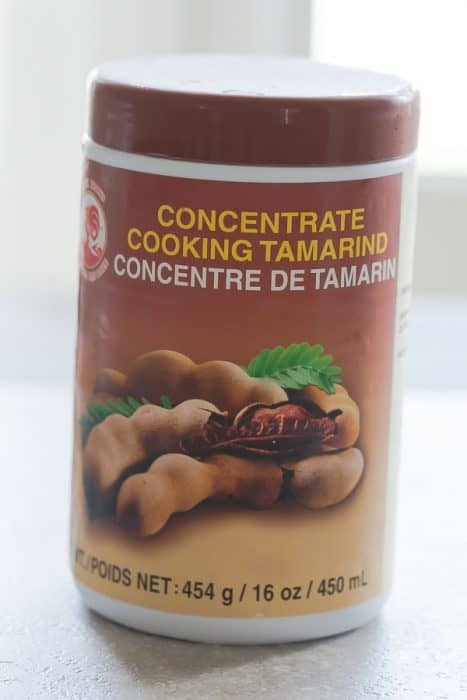 if you don’t have access to tamarind concentrate (more watery – NOT tamarind paste which is thicker) – use 3 tablespoons lime juice or rice vinegar instead. I use the one below which I get at my local Asian supermarket. 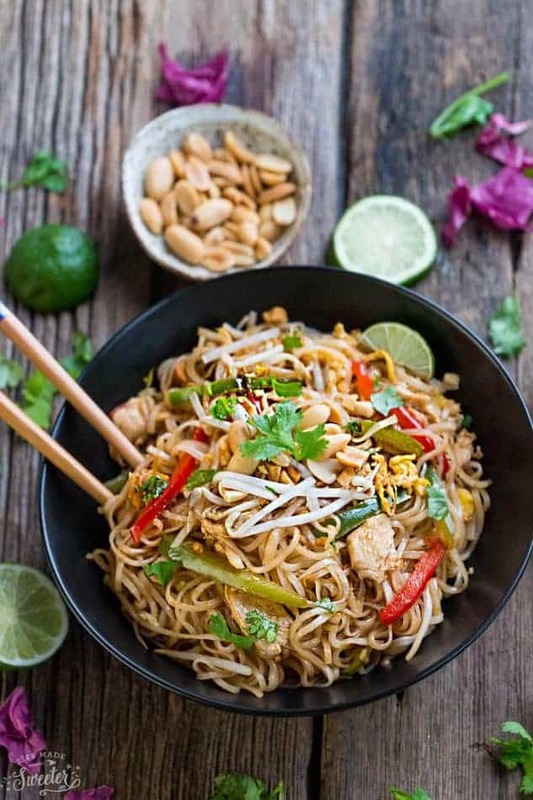 if you like a saucier Pad Thai – double the sauce and add desired amount to noodles. Save the leftovers for a stir-fry or even a salad. WEEKLY MEAL PREP-TIPS FOR YOUR SCHOOL OR WORK LUNCH BOWLS. For easier weekly meal prep – prepare all the vegetables ahead of time and store in an airtight container the night before. 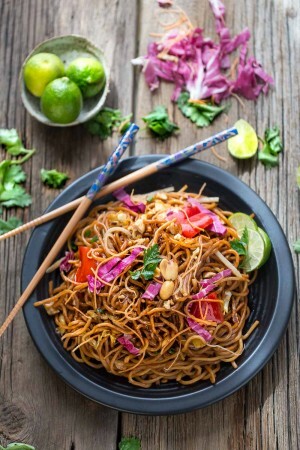 Chicken Pad Thai Noodles makes an easy weeknight meal. 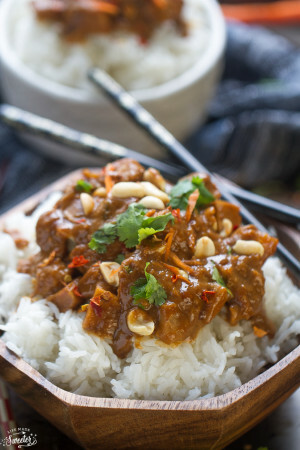 This homemade recipe is full of authentic sweet, sour, spicy and savory flavors that you love from your favorite takeout restaurant. Prepare the rice noodles according to package instructions. (I usually just soak mine for 6-7 minutes in boiling water). They should be soft but not mushy - see my photo above for how it should look at this point. Drain and immediately rinse under cool water and set aside in colander. While the noodles are cooking, whisk together the sauce ingredients in a medium bowl. If you prefer a sweeter pad thai - add additional sugar. For a spicier version, add additional chili paste. Heat the oil in a large wok or non-stick skillet over high heat. Add the chicken and cook until browned and mostly cooked through (about 3-4 minutes). Stir in the ginger, garlic and shallots and cook for 30 seconds, until fragrant. Add the carrots and bell pepper and cook for 1-2 minutes, until tender crisp. Push all the ingredients over to one side of the pan. Pour the beaten egg and scramble directly in the skillet. Add noodles and pour the sauce over top. 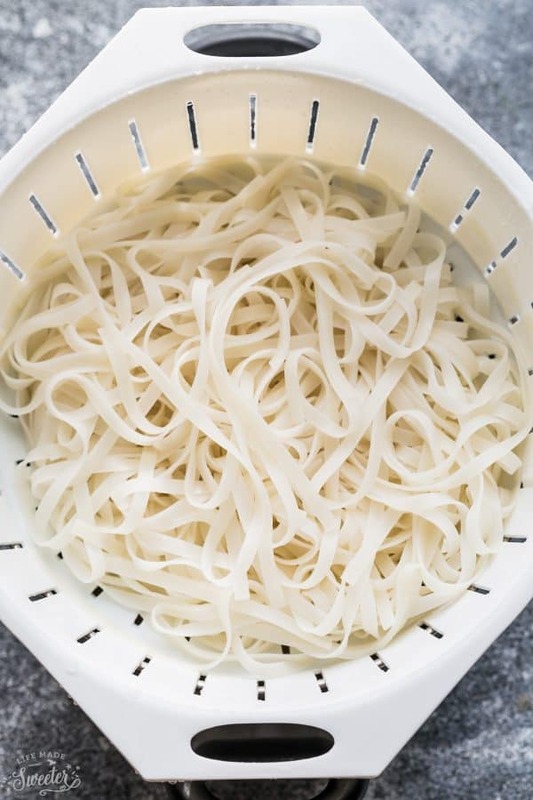 Toss with tongs to evenly coat noodles while allowing the sauce to simmer, thicken up and the noodles to absorb the sauce. Remove from heat (do not overcook the noodles or they will get soggy). 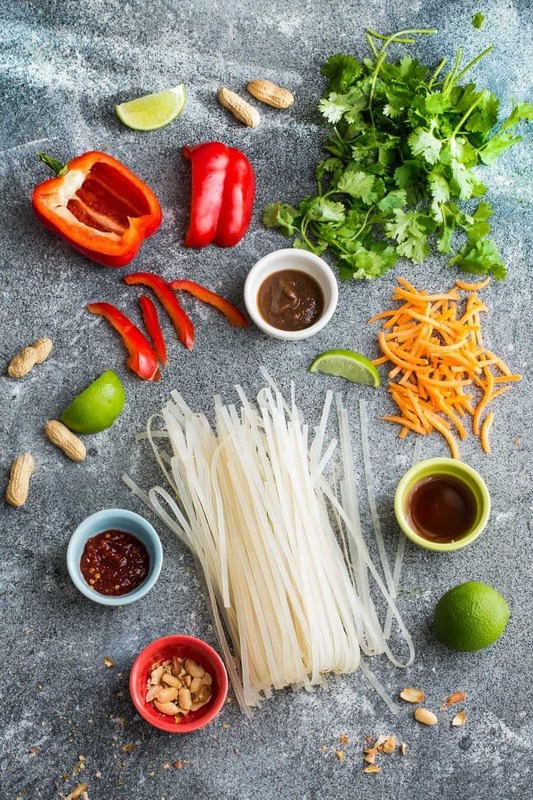 Serve hot on a large platter with garnishes by sprinkling on cilantro, bean sprouts, peanuts and green onions and additional lime wedges on the side. 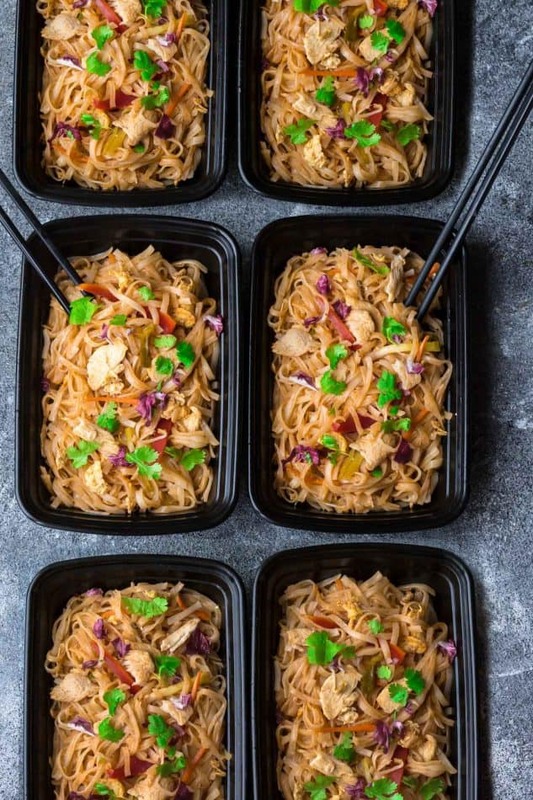 For meal prep, divide the noodles evenly into lunch boxes and store in refrigerator until ready to reheat. 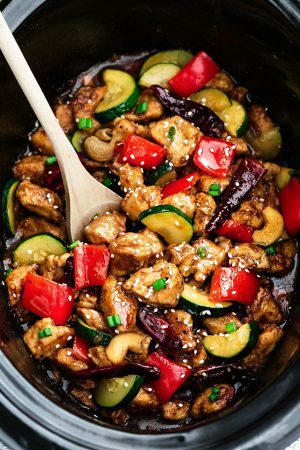 If you like more sauce, double the amount of sauce and add desired amount and save the rest in an airtight container for next time or use it up in a stir-fry or salad.